Canberra’s property prices increased by 3.3 per cent in 2018 to a median value of $601,275. Price drops in Sydney and Melbourne have seen the national property market record its worst fall since the global financial crisis but Canberra is still managing to keep its head above water according to the latest data from property analysts CoreLogic. 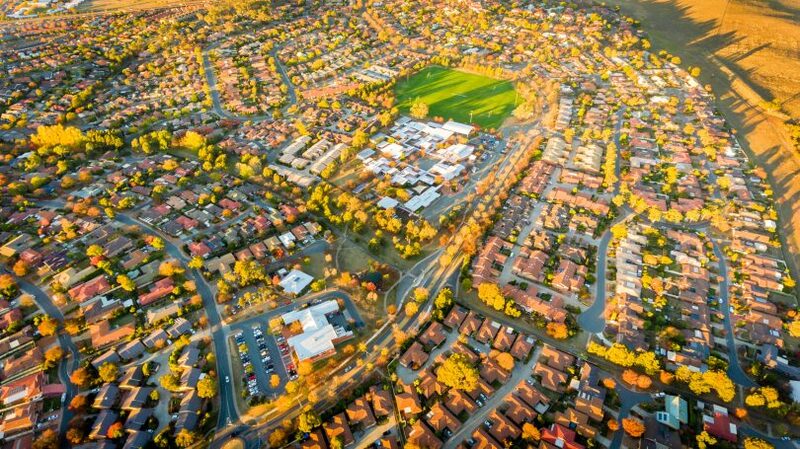 National property prices fell 4.8 per cent last year with Sydney down 8.9 per cent and Melbourne down 7.0 per cent whereas Canberra saw a 3.3 per cent increase to a median value of $601,275. Canberra’s median house price increased by 3.6 per cent in 2018 to $672,332 and the median unit price rose by 2 per cent to $440,813. Hobart was the only major city to see a higher rate of price growth with its 2018 median property price increasing by 8.7 per cent to $457,523. However, Canberra’s property prices remained flat over December and only increased by 0.6 per cent over the quarter with CoreLogic stating that the city recorded a weaker pace of growth last year compared to 2017. The CoreLogic December home value index results reveal that national housing market conditions ended the 2018 calendar year on a weak note, with the rate of decline consistently worsening over the year. “National dwelling values were down 2.3 per cent over the December quarter; the largest quarter on quarter decline since the December quarter of 2008,” the report states. It said that property values have dropped by 5.2 per cent since peaking in October 2017. “This is the worst fall we’ve seen since the GFC, which was a short and sharp correction, down about 5 per cent from peak to trough,” CoreLogic’s head of research Tim Lawless told ABC News. In a statement, Mr Lawless said the broad weakening in housing market conditions in 2018 highlights that the slowdown goes well beyond the correction in Sydney and Melbourne. “Although Australia’s two largest cities are the primary drivers for the weaker national reading, most regions around the country have reacted to tighter credit conditions by recording weaker housing market results relative to 2017,” Mr Lawless said. Mr Lawless said that “overall, housing market conditions showed a diverse performance over the year, demonstrating how varied the market is based on location and price points”. The CoreLogic report names the strongest capital city sub-regions as being Hobart, Canberra, Brisbane and Adelaide “where housing prices are generally more affordable relative to household incomes (although housing affordability has rapidly deteriorated across Hobart)”. However, the report states that apart from Hobart, “even the best-performing regions returned a relatively mild annual growth rate”. “Such a soft result amongst the best performing areas highlights that housing market weakness is broad-based and not just confined to Sydney and Melbourne,” said Mr Lawless. Seeing a ‘softening’ in the housing market in the ACT is a good thing for the younger generations trying to get into the market. Even with this so-called ‘softening’, house prices are still rising in the ACT. And nationally, over the last ten years, if we were to compare house price rises against wage growth, my guess is house prices would be way ahead!